Whilst the contribution of pore strips is not as dominant as that of various other beauty products such as face masks, moisturizers, gels, and anti-ageing creams, pore strips are expected to continue with its recognition as a key beauty product in the industry of cosmetics. As the technique of waxing is anticipated to gain popularity in offering skin care products, solutions like pore strips are expected to pave ways towards shaping preferences of the consumers. Transparency Market Research estimates that the worldwide sales of pore strips are expected to incur a promising growth in the years to come. There are quite a few market participants that are operating in the said market. Eminent names such as Walgreen Co., Lucky Fine, P&G, boscia, LLC, Unilever, Sephora, Kao Corporation, Ulta Beauty, Earth Therapeutics, and Boots adorn the global market for pore strips. 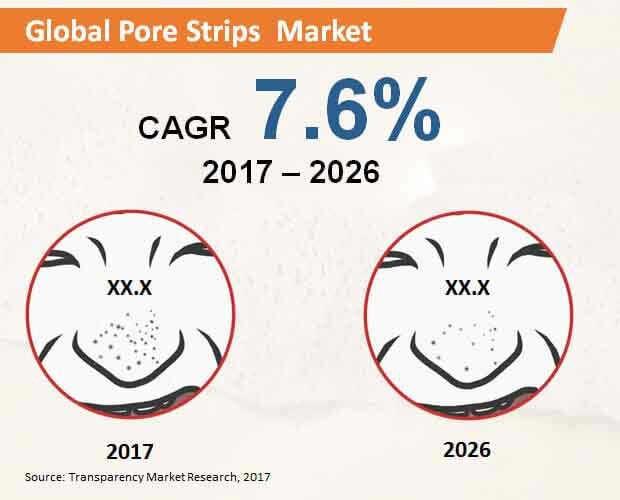 In accordance with its latest report, Transparency Market Research makes an assessment of the international pore strips market that is to expand at a growth rate of 7.6% CAGR in terms of value, over the forecast period that extends from the year 2017 to the year 2026. The business intelligence report makes an observation of the international demand for pore strips which has already been steady over the last few years, and is anticipated to be worth more than US$ 2.7 billion by the end of the year 2026. In terms of geography, the world market for pore strips has been divided into the regions of Latin America, North America, Middle East and Africa, Europe, and Asia-Pacific excluding Japan. The report makes an observation that the global demand for pore strips has been steady over the recent past, and will bring in revenues worth over US$ 2.7 billion by the end of 2026. The study further discloses that most of the demand for pore strips across the globe would be arising from the region of Asia-Pacific excluding Japan region. It is anticipated that owing to the high presence of various common skin problems in countries such as China, India, and other countries of the Asia-Pacific excluding Japan region will propel the sales of pore strips in this region. By end of the year 2026, it is estimated that almost around 35% of pore strips that are produced worldwide will be sold across the region of Asia-Pacific excluding Japan region. The major factors that would expectedly propel the world market for pore strips are economic pricing of the product and worldwide prevalence of blackheads as a common skin problem. Pore strips are being extensively utilized as a quick fix for the removal of blackheads. The main purpose of pore strips is to eliminate blackheads, dead cells and dirt from skin pores. Easy utility and simplicity of pore strips make them a common product amongst consumers with average disposable incomes.